My road to recovery would have been so much easier if only I known about Ironheart Foundation two years ago. After my bypass x 4, I left the hospital after six days and flew from Bangkok to Phuket to recover and start a new life. The following months became a journey. I thought at times that I would never get any better. Once I left the hospital after surgery, I never received any help or advice. I struggled in silence to deal with my feelings. Mentally I was a wreck! From the outside I looked fine but from the inside it was far from what it seems. As a person I had changed. I knew that I had to change my lifestyle and try to get back in shape. I tried going to the gym but did not enjoy it. Then, I discovered cycling. One year after surgery, cycling pulled me through. I started to cycle more and more and pushed myself to the maximum. I started to take part in both road and mountain bike races. Although I am not a champion, after every race I felt like one. Now I am finishing in the top 10 in age group 40-49 quite often. 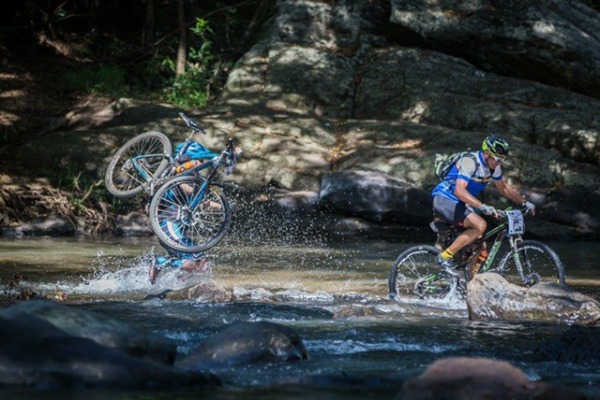 I have just completed a mountain bike stage race called Rumble in the jungle in Sri Lanka. This included climbing 8000m over four stages. This was a true test. There were times that I thought that I might not finish the stages but somehow pulled thru. I knew I had to complete this to prove to myself I could do it. If I could so can others that had open-heart surgery as well can. I went to this race for personal reasons: to prove that life does not have to stop after open hearth surgery and to show people out there to never give up. I hoped to raise awareness to all that we should not take life for granted. I had a beautiful wife and daughter but as time passed, I grew further apart from them. Finally two years after my surgery, I went through a divorce and was devastated. I believe so many of us struggle because we keep all this pain and grief inside us. My advice would be to keep reminding your love ones about your feelings and emotions. Don’t keep it in yourself! It will slowly eat you up and break you. I lost the two people that I love the most because of this. I don’t want this to happen to others. If I can help one person reading this, I will have achieved so much.